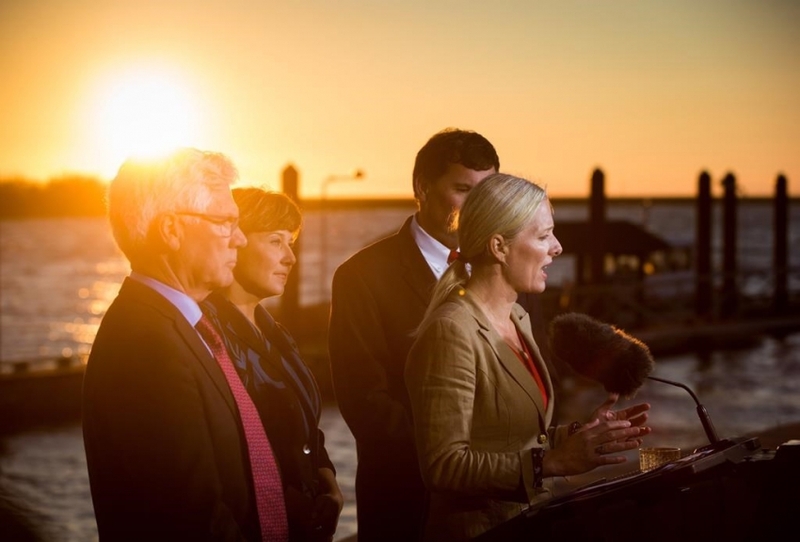 Environment Minister Catherine McKenna announced the federal government's conditional approval for the Pacific NorthWest LNG project in Richmond BC on Sept. 27, 2016. Photo by The Canadian Press. The federal government gave conditional approval Tuesday to the massive Pacific NorthWest LNG project planned for British Columbia's northwest coast. Environment Minister Catherine McKenna, Natural Resources Minister Jim Carr and Fisheries Minister Dominic LeBlanc travelled to Richmond, B.C., to announce their government's acceptance of what is expected to be one of the largest infrastructure investments in Canadian history. There are 190 legally binding conditions attached to the approval, including for the first time the imposition of a condition placing a maximum cap on greenhouse gas emissions, McKenna said. "This project was subject to a rigorous environmental assessment and today's announcement reflects this commitment," she told a news conference, which was interrupted by three hecklers from the Lax Kw'alaams First Nations band as the ministers spoke outdoors on the waterfront near Vancouver's airport. The Petronas-led $36-billion liquefied natural gas project on Lelu Island near Prince Rupert, B.C., would ship 19 million tonnes a year of liquefied gas to markets in Asia while pumping more than five million tonnes of carbon dioxide annually into the atmosphere. That would make it one the largest single greenhouse gas emitters in Canada, according to the Canadian Environmental Assessment Agency. The government's conditional approval sets the table for an autumn of more crucial decisions on a national climate change plan and energy sector infrastructure. But it doesn't necessarily mean the massive LNG project will ever get underway. Low global oil prices and an increasing supply of natural gas have depressed international prices for LNG, making the economics of the project less certain than they were when it was first announced in 2013. Pacific NorthWest LNG said in a statement Tuesday that it was pleased with the government's announcement. "Moving forward, Pacific NorthWest LNG and our shareholders will conduct a total project review over the coming months prior to announcing next steps for the project," said Adnan Zainal Abidin, president of Pacific NorthWest LNG. Despite the market uncertainty, the decision by the cabinet of Prime Minister Justin Trudeau signals the course the new Liberal government will navigate among competing interests on the energy and environment files. "The only way to get resources to market in the 21st century is if they can be done in a responsible and sustainable manner," McKenna said in a news release. "This decision reflects this objective." The government says the conditions it is placing on the project are aimed at minimizing effects on fish, fish habitat, marine mammals, wetlands, migratory birds and human health. But environmental groups saw a contradiction in the government's approach. "Approving this project is inconsistent with the federal government's commitments to lead on climate change and clean innovation," said Merran Smith, executive director of Clean Energy Canada. "The conditions that come with this approval set the bar too low." Karen Mahon, national director of Stand Earth, said the group expected a different approach from the Liberals. "How can Prime Minister Trudeau claim to be a climate leader on the international stage, while approving this new project that will become the single largest source of climate pollution in the country," she said in a news release. Carr said the facility will add nearly $2.4 billion per year in Canada's GDP. "This project further plants the Canadian flag on the world stage of natural gas exporters. Positions us to supply dynamic emerging economies while contributing to the fight against climate change."